Having hung out with church folk for several decades, I have come to expect the words “spiritual but not religious” to be accompanied by air quotes and a tone of disdain. But lately even non-religious folk have begun to hate on the SBNR. spiritual, but not religious’… translated from the psychobabble, can mean just about anything—that the speaker is an atheist who fears social disapproval or a fence-sitter who wants the theoretical benefits of faith, including hope of eternal life, without the obligations of actually practicing a religion. 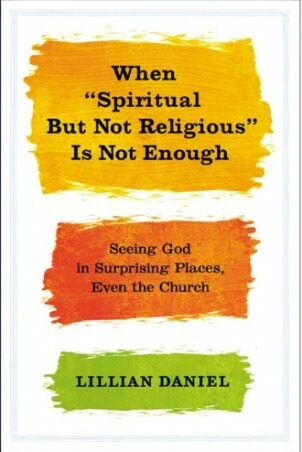 The Reverend Lillian Daniel’s latest book, When “Spiritual But Not Religious” Is Not Enough, will not disappoint readers who have come to enjoy her self-deprecating humor, her theological insights, and of course, snarky jabs at those fence-sitters who want it all: the SBNR. The book is a collection of stories and essays, some more sermonic than others. There is a lovely reflection on being the “stand-in church” for a dying friend who was not a church member. A chapter on prayer explores the age-old question of why anyone should bother praying to an all-powerful, all-knowing deity—for Daniel, prayer is the prime antidote to self-deception. A tale about her angry grandmother and a naughty dog provides an opportunity to think about prejudice that perpetuates an us-vs.-them mentality. A memoir about often being the new kid in school causes her to consider the radical teachings of Jesus about whom it’s acceptable to eat with. A connection to an ancestor on the Mayflower provides fodder for thought about immigration in the 21st century. Perhaps the most powerful chapter is a meditation on teaching a class among prisoners at Sing Sing. The writings of Paul the apostle about dying with Christ, in whom new life is hidden, has special resonance among people who are almost literally dead to the world, and whose new life is hidden behind bars. At the center of most of these reflections is her congregation. It becomes clear that what is most important for her about Christianity is not its doctrines, narratives, sacraments, or even individual faith. It is community—the people who are “stuck with you.” What makes Christian community different from other kinds of community is the fact that it is shaped by a tradition of particular narratives and rituals and practices that, at least ideally, push back against self-serving consumer capitalist culture. It is for this reason—the lack of commitment to being stuck with any particular community of sinners—that the SBNR are particular targets of her judgment. Daniel is writing primarily for Christians, and she is likely to appeal to the folks for whom ecclesiology is of primary concern. Roman Catholics and neo-orthodox post-liberals alike will especially appreciate her insistence on staying connected, not only to two thousand years of Christian tradition, but also to those annoying, smelly people next to you in the pews. Church, for these folks, is the only antidote to perverse secular rhythms and virtues, and Daniel is playing their song. Other Christian readers, however, may be dissatisfied. Although Daniel does profess a very personal faith in the nearby Jesus and the awe-inspiring Christ, Bible-thumpers and traditionalists will not necessarily appreciate it coming from an ordained woman in one of the most socially liberal denominations in the world: “a welcoming and inclusive church where you are not expected to leave your brain outside on the sidewalk” (no offense, all you other churches!). And although she is usually very careful to use theological language that no one can call heretical, she also attends yoga classes and has no problem embracing the full meaning of “Namaste” in that context. The folks most likely to be alienated by her book are, unsurprisingly, the seekers—those who call themselves SBNR, of course, but also those who want religious community, or at leastwant to want it (full disclosure: like me). For these folks, who may be, as she says, “shopping” for a place to belong, Daniel has absolutely no patience. Perhaps the most telling tale in this regard is her meditation on the differences between Marys and Marthas: Martha represents efficiency and good works (not to say control freaks), while Mary represents leisure, passivity, and slackerdom—with perhaps a bit of grace thrown in. Martha does, while Mary is. I, for one, have been estranged from church for the past few years specifically because I have the exact opposite feeling: I see the church as being full of Marthas, type-A achievers (albeit of the friendliest kind) with boundless energy who have created church in their own image; and though I crave scripture, communal prayer, and hymnody, I can’t stand the thought of being expected to join in what often feels like busy-ness for busy-ness’s sake. I already have to be a Martha in my work and home lives; what I lack is silence, something more easily found among Buddhists than Christians. I desperately need just to sit, mindfully, with others doing the same. But I feel ashamed of asking for this at church, where I fear—and Daniel’s book seems to confirm—that people will see me as a lazy couch-potato, never doing enough. But while Daniel has not provided an obviously warm welcome for those who may be trying to figure out a way to be in religious community, it is possible to detect a bit of tenderness between the snarky lines. Her thoughts on the prodigal son and his bitter elder brother are strikingly apropos of the book’s overarching concern: “resentment is like swallowing poison and waiting for the other guy to die,” she notes wisely, even amidst nagging thoughts like, “Why am I struggling and that jerk seems to be rushing by me, coasting through life?” In short, this book is a very honest confession of how much Lillian Daniel needs church, as well as how tired she is of having to defend her religiosity to liberals who don’t feel the same need, and who are narcissistic enough to think all religion is therefore for suckers. So really, who can blame her for being a bit sarcastic? Most of us who are prone to sarcasm would probably admit that it gets worst when we are feeling most vulnerable, and true religion taps into our most vulnerable spots. If the goal of Daniel’s writing is to affirm the faithful in their commitment to church membership, she’s taken exactly the right tack. Her venting will garner lots of laughs and plenty of “Amens!” But if, having vented, she then hopes to win over some of those who might be testing the waters, she might consider ridding her rhetoric of stereotypes and caricatures designed to shame them for not yet belonging.